Last week I had the chance to interview clutter guru Meryl Starr: Personal Organizer, author, and the past voice of the radio talk show “Let’s Get Organized with Meryl Starr.” With 23 years of ground-breaking experience in this growing industry, Meryl has a lot to offer on the topic of maintaining organization and cutting clutter out of all aspects of your daily life. Meryl’s passion for organization has always been a part of who she is. “For me, it’s just second nature,” she says. Even as a teenager, her room was so neat that her brothers would tease her by introducing it to their friends as “the museum.” This natural ability to organize the world around her didn’t turn into a career until an incident that occurred years later, as she was attempting to cook breakfast in a friend’s kitchen. Her friend’s cupboards were so packed that things started falling out of them as she looked for what she needed. Unable to contain herself, she asked, “Why don’t you let me organize your kitchen?” Hours later, after going through every drawer, cabinet, and even the refrigerator, she had collected eight large garbage bags of old, obviously unused, duplicate, or otherwise unnecessary clutter. When her friend’s husband came home, Meryl said, “Steven, you have to see what I’ve done today.” After she showed him her work, he said, “You know, you could charge for that.” Meryl reflects, “A lightbulb went off in my head, and I said, “I’m going to start my own company and call it ‘Let’s Get Organized.’” The rest, as they say, is history. When asked what she considers the most challenging organizational project she’s faced (whether person or home), Meryl said, “Someone who has a difficult time letting go of their possessions, even if they are worn, torn, and very used.” Several clients have contacted Meryl out of desperation, asking her to do something for them. The best she can do in that situation is organize all they have and make sense of it. “It’s sad, really. It’s more like they need psychological help.” This highlights an important truth: before you can organize, you have to be able to declutter. Next, Meryl gives us some practical tips for getting started. Identify what kind of clutterer you are. Look around: do you tend to collect things with sentimental value? Media? It’s important to identify what you’re holding on to. Ask yourself, “how many do I really need?” This goes for sheets, clothes, stemware, clothes, and everything else in your home. When deciding what goes, get rid of anything old, worn, chipped — anything you don’t need, want, or love. If it’s not doing anything for you, get rid of it. Set a deadline (such as six months). This will keep you motivated to keep pressing on as you work toward your goal date. Don’t just throw — give things away to family, friends, and charities. Having a list of people and places you can donate and give to will make it easier to let go. Those who live in small spaces might have a particularly hard time even keeping all the things they need, love, and enjoy in one tiny space. If you have a lot of special memorabilia, Meryl suggests using a storage unit, such as The Box Butler where she keeps her own collection of photo albums. “They pick up and deliver whatever you want to store, and they’re not expensive.” You can also digitize media you’re having a hard time finding space for. This goes for paper clutter, as well. Opting for electronic statements and paying your bills online will cut out a lot of paper clutter right from the start. Living in a small space might mean changing a few habits. For instance, if you don’t have space to store groceries, it just means you’ll have to go to the store a little more frequently. Tiny living is a choice, so make it one that works for you. So what do you do once you’ve de-cluttered your home as much as you possible can? It’s time to go back and organize it. 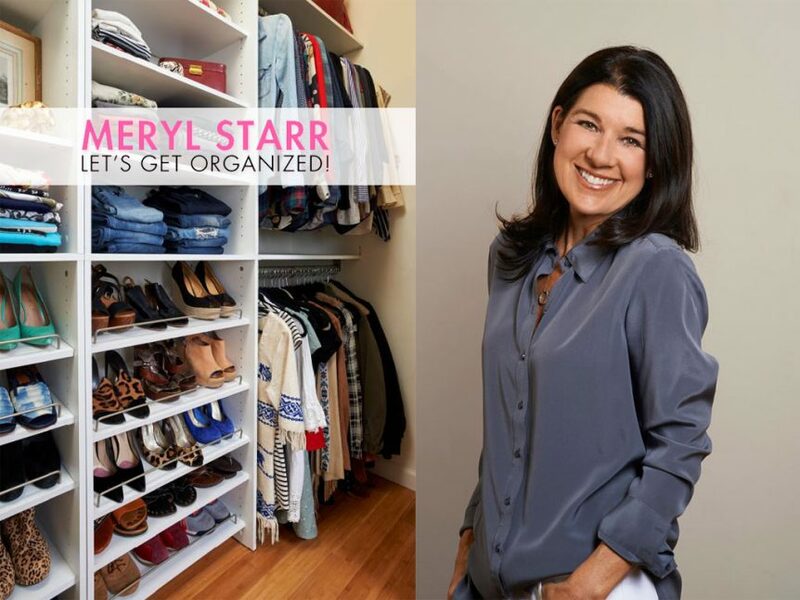 Over the years, Meryl’s collected a wealth of practical knowledge on how to best organize your home. Here are some of the proven tips she’d like to share with the readers at Tiny Living. Customize. If you’re living in a small space and you need a piece of furniture to fit in a tight or uniquely-shaped spot, have someone design and build it for you. Utilize built-in storage. Capitalize on the hidden storage in ottomans, coffee tables, and other furniture. Use your vertical space. In a small space you can put shelves all the way up to the ceiling. Go high! Nest pots pans and glassware inside one another. You might want to place shelf liner or paper towel in the pans if you don’t want them to scratch. Use square containers. Instead of round storage containers, opt for square ones. You wouldn’t think it would make that big of a difference, but it will help you maximize every inch of space! Fold clothes tightly, and double hang. This is all about maximizing space. It’s a good idea to use thin hangers — avoid bulky ones, since they take up too much space. Space-saver bags. This is one I learned the value of personally, from my cross-country trip. Meryl affirms they’re a great place to store out-of-season clothing and bulky blankets. You can even use the trunk of your car to store sports equipment or summer gear. The key is to think out side the box, get creative, and yes…get organized. For more information or to hire Meryl Starr please visit www.merylstarr.com. You can also follow her on Facebook, Instagram, and LinkedIn. Please check out this new awesome product that just launched – Hassle-Free Tie Hanger! We would love to have this product mentioned in your blog. It’s available at Amazon.com (http://www.amazon.com/dp/B016QXNG82). If interested, email me and I’ll personally send you one free!